middle Europe, Colorado. Oregon, Utah, British Columbia, Ontario, Quebec. Naturalized in Oregon, which is similar to California. Amsberry, K.., Jules M.., & Menke R.. J. (2008). Pest risk assessment of Alyssum murale and A. corsicum. Kingsland, R.L.. (2015). Volunteers battle yellow-tuft alyssum in southern Oregon. On Oregon noxious weed list, after escaped from phytoremediation project for a nickel mine. Reported more than a mile from planted site. Masses of plants located along roads. Spreading in the Illinois Valley, OR. Habitats where growing include disturbed sites as well as undisturbed native plant community hundreds of feet from trails or roads. Studies showed that they are capable of growing on serpentine soils. Oregon Dept. of Agriculture (0). 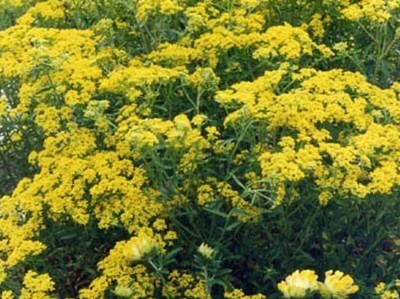 Oregon Noxious Weed Risk Assessments. Yes, Southern Oregon is similar to California based on Cal-IPC's climate map. Alyssum corsicum is also a noxious weed in southern Oregon, which is similar to California's climate. Native range is temperate Asia (Armenia; Azerbaijan; Georgia; Ciscaucasia, Turkey) , eastern and southeastern Europe (Moldova; Ukraine; Albania; Bosnia and Herzegovina; Bulgaria; Greece; Macedonia; Montenegro; Romania; Serbia). Based on the native range and points on GBIF (http://www.gbif.org/species/3045111), more than half of the areas match California based on Cal-IPC's climate map. Creating monocultures in small areas in Oregon (being removed before it can spread further). Photos in the Oregon Weed Risk Assessment show dense stands. Oregon did a thorough Weed Risk Assessment and did not mention fire as a risk, so I am answering no. Likely toxic to livestock (and maybe wildlife) due to its abiltiy to accumulate toxic metals. Moderate ingestion would likely cause poisoning. Photos from Oregon Weed Risk Assessment show dense monocultures. Plants in Oregon grow up to 1m in height, taller than the 0.5-0.75m reported from the native range. Plants grow with multiple woody stems. Based on height and the woody stems, I am answering yes that it could slow movement of humans or animals. A woody shrub, so vegetative reproduction seems unlikely. A woody shrub, so this ability seems unlikely. Produce "hundreds" of seeds, maybe thousands. Germination described as "prolific." Research found 92% seedling survival rates on nickel-rich soil under field conditions. In a greenhouse trial, seeds germinated in one week. Reproduces within one to two years. Newspaper article says it flowers and seeds throughout the year in Oregon but the official risk assessment did not describe this. No mention of this. Fruits are papery, circular to oval flattened silicles with a single flattened seed, so they do not have obvious adaptations for animal dispersal. Fruits are papery and light and easily blown by wind. Portions of the flower with attached fruit form miniature tumbleweeds dispersed by wind. Seeds are able to float when removed from covering. Seeds have been shed from bales in Oregon. Infestation at a dam in Oregon is presumed to have developed from seeds carried on vehicle tires driven by employees traveling from infested sites. However, the seeds do not seem to have a mechanism for attaching to tires, clothes, etc.